Meathead Movers is here to take care of the heavy lifting for you on your move, wherever you are going. Our clean-cut student-athlete Garden Grove movers are ready to get you safely settled into your new home. If you are moving to or from anywhere in California, we are the moving company for you! Our professionally-trained student-athlete Garden Grove movers and our moving concierge service are here to help you with every stage of your move. Garden Grove is home to one of the biggest community festivals in the western half of the country, the Garden Grove Strawberry Festival. Celebrating the area’s agricultural roots, the festival has been an eagerly anticipated event since 1958. Moving to Garden Grove will put you in a prime position to gather with over 250,000 revelers to witness the largest strawberry shortcake in the world get sliced, enjoy carnival rides and feast your eyes on a celebrity filled parade. 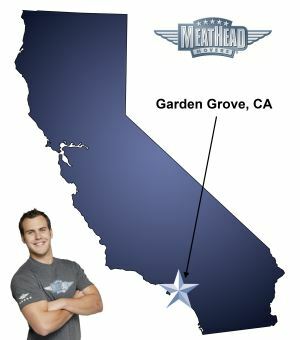 If you are searching for the most reliable and efficient Garden Grove movers on the market, Meathead Movers far surpasses the competition. Meathead Movers only hires the cream of the crop. Each mover we employ is a physically fit student-athlete who jogs when he isn’t carrying anything. This has a fourfold purpose: it keeps our employees in shape, gets the job done faster, saves you money, and sets us apart from the pack. All our employees are smoke and drug-free. Additionally, you can rest assured that each of our movers will be in prime physical and mental shape to move your belongings carefully and swiftly to your new residence. Looking for long-distance Garden Grove movers? Meathead Movers has got you covered. Offering local, long-distance, and commercial moving services, we offer fixed prices for long-distance moves with no hidden fees. We won’t charge you more for a heavier truck or slap on additional costs at the last minute. All our movers are licensed, insured and trained to handle your possessions safely throughout your entire move. We even offer Princess Packers to ensure your belongings are wrapped and packed with the utmost care, saving you time and energy. We also provide a complimentary Meathead Concierge Service. At your request, we can connect you to a host of useful services, including storage unit providers, security system installers and more completely free of charge. Moving may seem like a stressful ordeal, but it doesn’t have to be nerve-wracking and costly. Meathead Movers are the best Garden Grove movers available and are dedicated to making your move as easy and simple as possible. Should you be dissatisfied with our services for any reason, we are the only California moving company offering a 100% satisfaction guarantee. Contact us today to get a free, no-obligation moving quote. Moving to Garden Grove? Here are some helpful resources. Garden Grove Water Services Dept. View more Garden Grove resources. Meathead Movers were efficient, fast, and friendly. Will recommend them to everyone. I was impressed with the care they took when moving the furniture and how quickly they did it. The price quoted was the price charged-no extras added. On time. Brian and Miguel were very courteous, asked where I wanted them to put things so I don’t have to move anything around myself. They actually do jog when not carrying furniture. I hope I never move again but if I do, this is who I’m calling. Very respectful of our belongings. Courteous, and professional.